Summon: Shackle an enemy creature. Mace of Encumbrance is a rare Intelligence item card. It is part of the Core Set. In addition to the card's availability in the Core Set, two copies are included in the Warriors of Hammerfell deck. 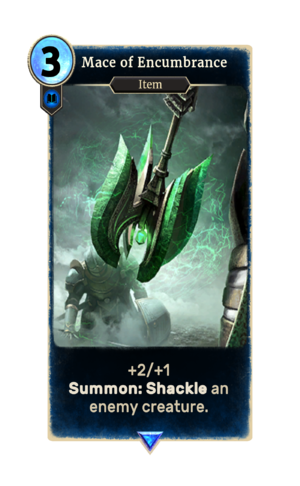 Generic glass maces called Mace of Encumbrance were featured in Oblivion as random loot, though the depiction in the card's art is more akin to Skyrim's Glass Maces. The knights in the card's art are Bretons clad in Breton armor as it appeared in ESO. A mace of encumbrance appears in the hand of the alternate-art Master of Arms. This page was last modified on 24 September 2018, at 22:59.